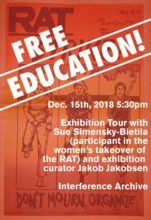 Interference Archive | Guided tour of Free Education! What is a university? What does the university have that we want? What does the university have that we don’t want? How would a free university feel if we could build one from scratch? Sue Simensky Bietila was involved in the original Free University of New York, was part of the women’s takeover of the Rat newspaper, and was a member of WITCH! (Women’s International Terrorist Conspiracy from Hell!). Jakob Jakobsen organized the Free Education! exhibition, one of a series of projects he has worked on documenting alternative education experiments in the 1960s–80s across the globe. Both Sue and Jakob are visiting from out of town, so this is a unique opportunity to engage with both of them!